Please join me on Saturday, October 6, for a discussion about painting and anxiety with Dr. Scott Hunter the Director of Neuropsychology in the Departments of Psychiatry and Behavioral Neuroscience and Pediatrics at the University of Chicago. In addition to his work in the area of Psychiatry Dr. Hunter is a contemporary art collector and expert on contemporary painting. He will be leading a group discussion about the paintings in the Cleve Carney Art Gallery's current exhibition "On Anxiety". This event is free and open to the public. The talk begins at 1pm. If you missed the closing for Windows, Doors, and Mirrors at Roman Susan Gallery you can watch the highlights of the dance party here. 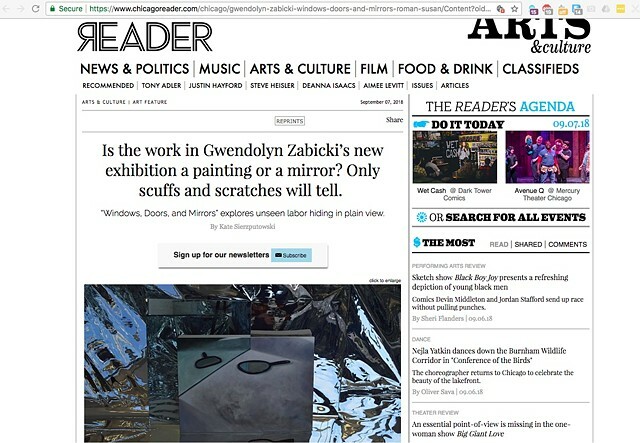 Windows Doors and Mirrors was reviewed in the Chicago Reader by Kate Sierzputowski. Thank you! You can read the article here. 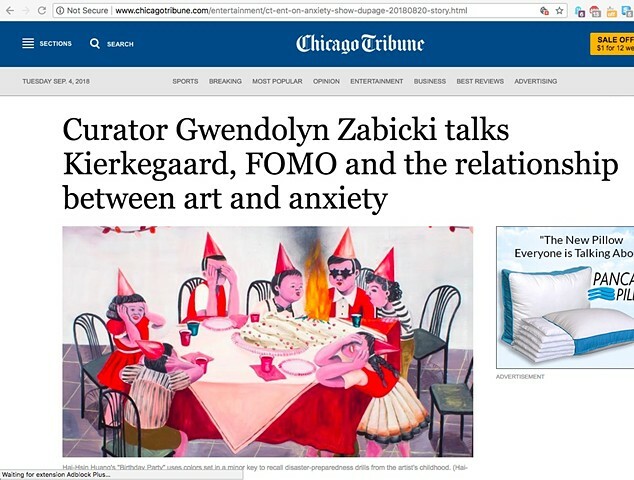 On Anxiety was written up in the Chicago Tribune. You can read the full article here. I've curated a show at the Cleve Carney Art Gallery at the College of DuPage titled "On Anxiety." 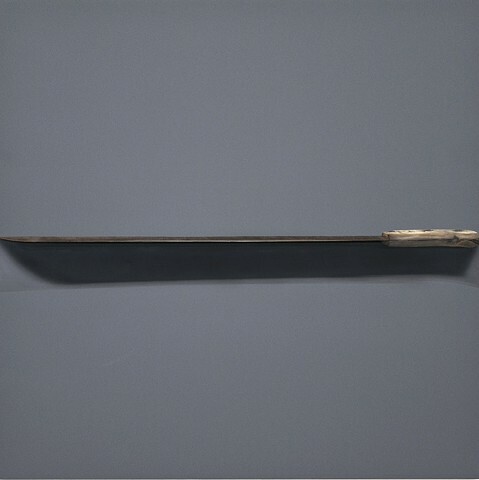 Featuring work by: Matthew Bollinger, Alexander Bradley Cohen, Jennifer Dierdorf, Ethan Gill, Justin John Greene, Mika Horibuchi, Hai-Hsin Huang, Ben Murray, Veronika Pausova, Celeste Rapone and Brandi Twilley. 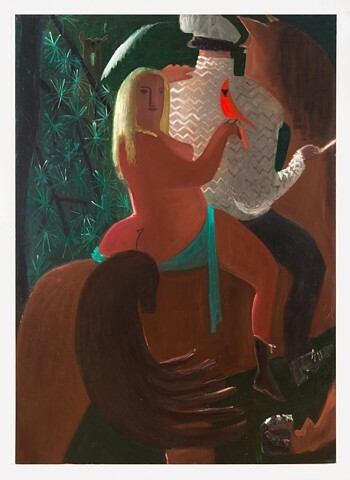 Women Painting Men opens May 20th 3 to 6pm at the Riverside Arts Center, featuring work by Karen Azarnia, Mel Cook, Katie Hammond (Halton) Celeste Rapone, Jessica Stanfill, and me. The show runs until June 23rd. Women Painting Men was reviewed in the Chicago Tribune! 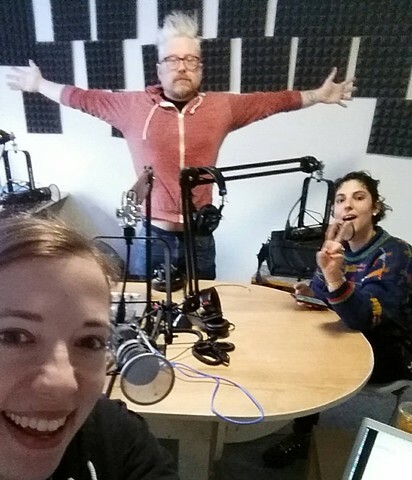 I was interviewed on Bad At Sports. I've wanted to be on that show for years! My paintings will be in an exhibition titled, What Have You Got To Lose? at Slow Gallery along with work from Hyegyeong Choi, Darryl Terrell, and Orkideh Torabi from February 17 to March 17, 2018. Thank you Paul and Jeffery! "Many of us end up seeing very little of ourselves reflected in images that claim to represent. For some, we simply belong to groups not looked at, not the center of conversation. For others, there is an enormous gap between the facade that is reproduced and the version of us that is purportedly witnessed. One of the ubiquitous approaches is to speak for oneself. To represent. After all, I know my own story better than anyone. "What do I have to lose?" A question designed to feel supportive, whether or not it bolsters anyone. To spur in a worthy endeavor. But it shifts when put upon me from another. "What have you got to lose?" There is actually tremendous vulnerability in making oneself visible, the center of focused observation. The question demeans, assumes that whatever it is you may hope to protect is somehow less than, unworthy. It diminishes whatever efforts are projected, as if the the effort demanded is somehow less than what I have to gain. Assumes my gains, however measured, are sufficient for someone such as I am. 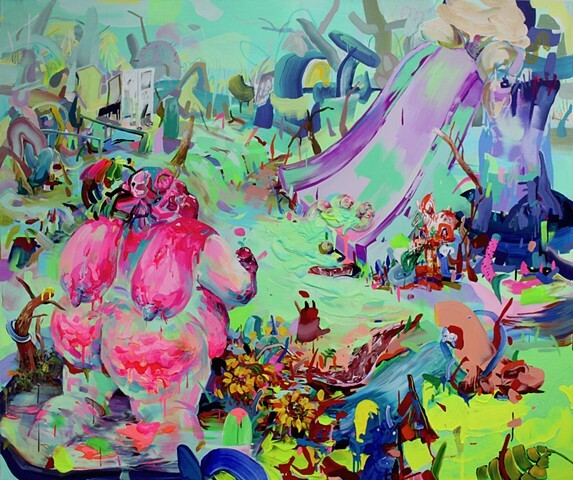 Despite vulnerability, these are artists who seek to reflect what is often left unseen." I'm curating a show titled Nothing Is Ours But Time. It opens February 9th, 2018 at the Ukrainian Museum of Modern Art. How many times have you been unable to sleep at night thinking about all the things left to do? Going over what you were able to accomplish and what tasks were postponed and how much time was wasted on chores, commuting, and procrastination. How many of us have compared our success to that of our friends and felt panic, jealousy, and dread? Almost 2000 years ago, Roman Stoic philosopher Seneca wrote letters to his friend Lucilius Junior warning him that "while we are postponing, life speeds by." There is some comfort in knowing that even brilliant philosophers of ancient Rome suffered the anxieties of daily life. However, in his letter, Seneca reminds his friend that "nothing is ours except time." The act of painting is an attempt to capture a moment, to preserve a gesture or an image in a suspension of pigment and oil. The artists in this exhibition use painting as a way to mark time and to contain it. Their work is focused on capturing fleeting everyday moments. 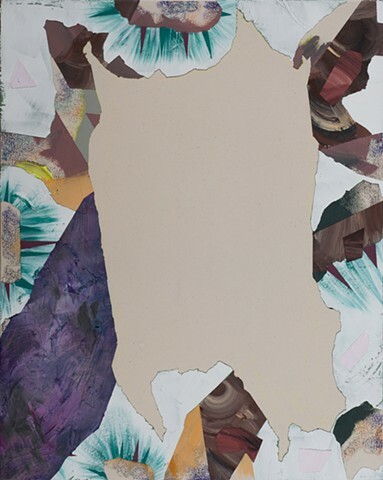 Selina Trepp uses and reuses only the materials currently present in her studio to make work. Ultimately, she will leave behind little more than digital images for her descendants to contend with. 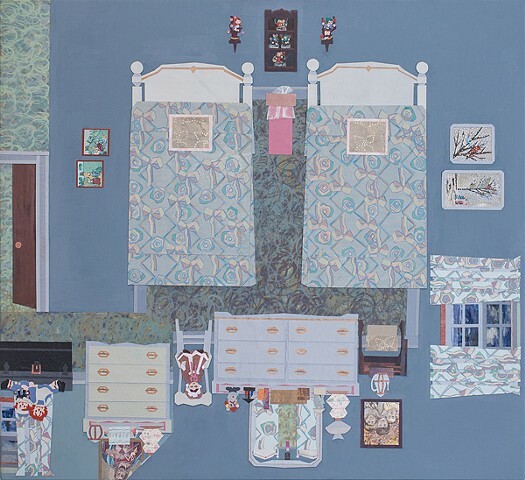 Mel Cook is a modern-day Vanitas painter, reminding the viewer of his or her own mortality. Through painting she responds to inequity and death with uncorked anger. Karen Azarnia's triptych of paintings documents a handprint on a window that disappeared over the course of an afternoon drive. Erin Washington maintains no illusions that her work will serve as a lasting legacy after she is gone. Her drawings and paintings, done in chalk and fugitive pigments, are designed to fade, smudge, and fall apart. Time still slips through our fingers, but every moment spent in an act of creation is one that we can count as ours. Continue to act thus, my dear Lucilius—set yourself free for your own sake; gather and save your time, which until lately has been forced from you, or filched away, or has merely slipped from your hands. Make yourself believe the truth of my words—that certain moments are torn from us, that some are gently removed, and that others glide beyond our reach. The most disgraceful kind of loss, however, is that due to carelessness. Furthermore, if you will pay close heed to the problem, you will find that the largest portion of our life passes while we are doing ill, a goodly share while we are doing nothing, and the whole while we are doing that which is not to the purpose. What man can you show me who places any value on his time, who reckons the worth of each day, who understands that he is dying daily? For we are mistaken when we look forward to death; the major portion of death has already passed. Whatever years lie behind us are in death's hands. Therefore, Lucilius, do as you write me that you are doing: hold every hour in your grasp. Lay hold of today's task, and you will not need to depend so much upon tomorrow's. While we are postponing, life speeds by. Nothing, Lucilius, is ours, except time. We were entrusted by nature with the ownership of this single thing, so fleeting and slippery that anyone who will can oust us from possession. What fools these mortals be! They allow the cheapest and most useless things, which can easily be replaced, to be charged in the reckoning, after they have acquired them; but they never regard themselves as in debt when they have received some of that precious commodity—time! And yet time is the one loan which even a grateful recipient cannot repay. What is the state of things, then? It is this: I do not regard a man as poor, if the little which remains is enough for him. I advise you, however, to keep what is really yours; and you cannot begin too early. For, as our ancestors believed, it is too late to despair when you reach the dregs of the cask. 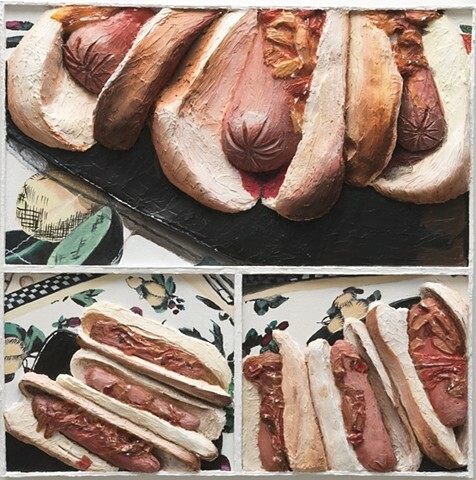 Of that which remains at the bottom, the amount is slight, and the quality is vile. Farewell. I am lovingly referred to as a "rising star" in this Chicago Magazine article. I curated a show titled Not Knowing at Heaven Gallery which runs September 1st to October 14th. 2017. 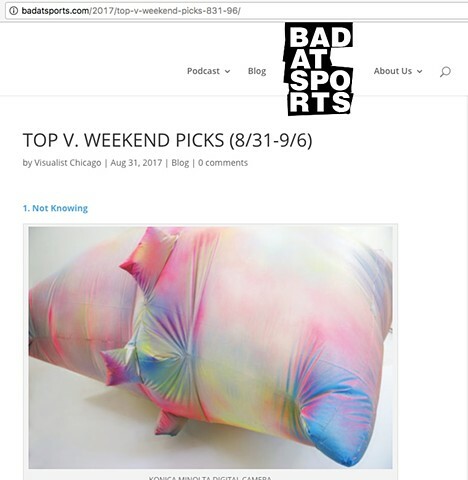 It was chosen by Bad At Sports as their number 1 weekend pick! 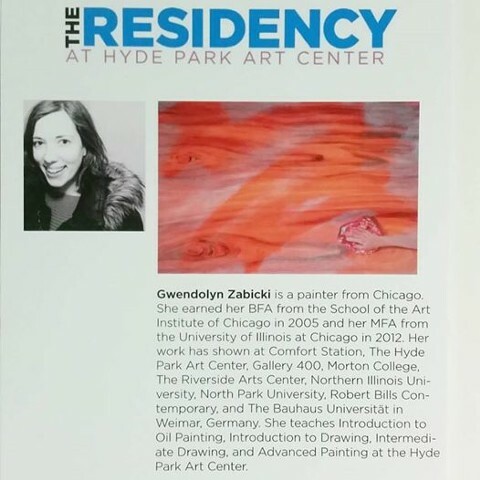 I'm an artist in residence at the Hyde Park Art Center until May 2017. Thanks HPAC! I have some paintings in a group show titled, New Business, at the Hyde Park Art Center until October 2016. 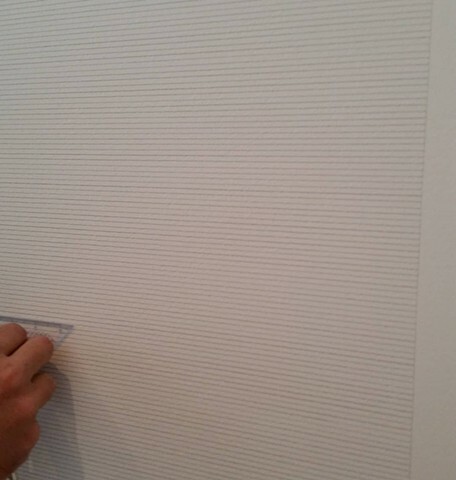 For the month of November, I will be working on Sol LeWitt's wall drawing #63 at the Art Institute of Chicago. It is on the second floor of the Modern Wing, near the stairs. Come visit me (Monday through Saturday) and we'll have lunch. September 26th, 2015 6-10pm. Tickets are $15- $250. I've got two paintings in a group show titled, "Finding Prospect in Myth." The show opens July 22nd and runs until August 4th. Curated by Natalie Jacobson. I will have a solo show at the Riverside Arts Center May 8th to June 13th 2015. The reception will be Friday May 8th from 7 to 9pm. Reception: October 9th from 6:00- 8:00 pm. 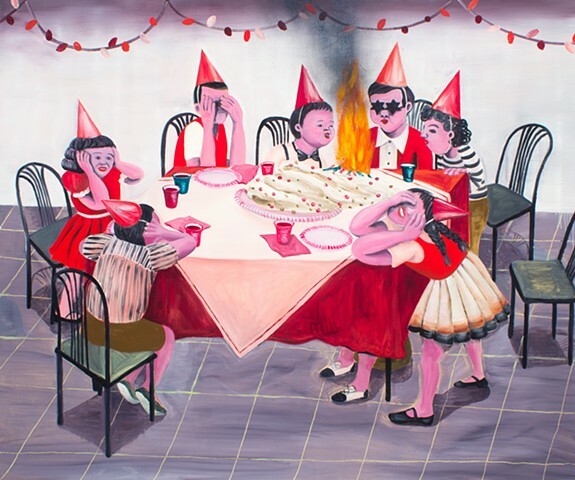 I'll be in a group show with Eleanor Ray and Greta Waller titled, Cool and Dark, opening July 11th, 2014. I'll have some paintings at Morton College in Cicero, IL this summer, June 14th to August 2nd. I've put together a second year of the Lillstreet Lecture Series. I'm very proud of this year's group! Local emerging and mid-career artists, critics, and curators give 45 minute presentations on their work in the new Lillstreet Loft, located down the street from the art center at 4437 N Ravenswood Ave, Chicago IL. This series is free and open to the public. SUPERMARKET 2014 – Stockholm Independent Art Fair will be held 14–16 February 2014 on the 3rd and 5th floor of Kulturhuset in central Stockholm. I'm at a month long residency at the Vermont Studio Center. It is worth doing if you are considering it. Getting things done, meeting lovely people. I put together a new show at Frogman Gallery, Contemporary Romance, featuring work by Amanda Brown, Simone Chagoya, and Stephanie Del Carpio. I have some paintings in a group show at The Carlson Tower Gallery at North Park University. and closes Wednesday, November 27. The reception will be on the closing date, November 27th. I will be in a group show, Isolated Incidents, at Chapel Projects in Logan Square. The opening is Saturday, October 12th from 5 to 8pm. Artists include Karen Azarnia, Garrett Baumer, Alice Costas, Paige Fetchen, Heejin Hwang, Joanna Pike, Maria Vergara and Eric Zohn. In case you couldn’t tell, WTT? loves the ladies, and we couldn’t be more excited to see the rest of the art world catching on. One lady show opened up this weekend with two to follow next week at Heaven and at the Frogman Gallery. “Lady Painters” curator, Gwendolyn Zabicki, sent us a hot tip on some required reading by participating artist, Sarah Weber. 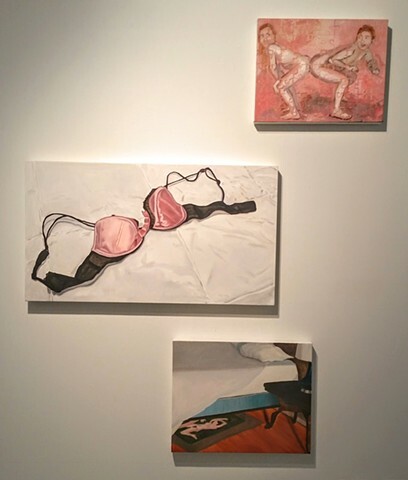 “Had I written a critical essay for Lady Painters, I would have liked to have written the very excellent one by Sarah Weber for Being a Woman in an All Woman Show.” WTT? couldn’t agree more. You can prep for both of these openings next weekend by reading Weber’s statement now." I curated a show at Frogman Gallery titled, Lady Painters, featuring work by Karen Azarnia, Angela Bryant, and Melody Saraniti. I have a new pop-up gallery downtown, which I've named Frogman. This space is mine to curate for the next six months to a year! My second show, Never A Lovely So Real, is opening this Thursday, July 11th (6 to 9pm) with work by Clarissa Bonet (photography), Dmitry Samarov (painting) and Noah Vaughn (photography). 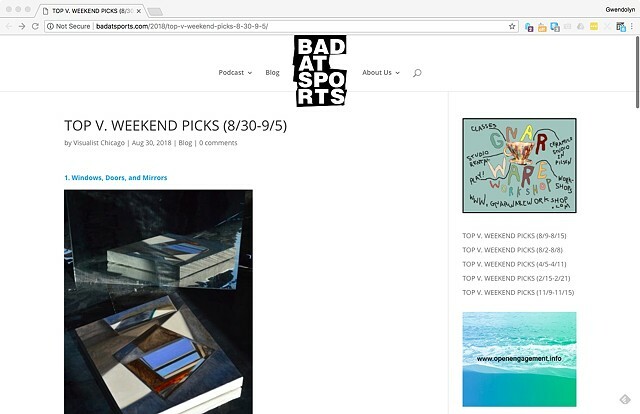 I curated a 40 person show in four pop-up galleries for the Milwaukee Ave Arts Festival. Ben Shurtleff wrote a beautiful article about me, painting, and SLAC for The University of Chicago humanities magazine, Colloquium. I'll be in a group show with Jeff Prokash, Morgan Sims, and Nathan Vernau. Alderman Rey Colon has partnered with me and SLAC. Mentioned in the 35th ward newsletter: dl.dropboxusercontent.com/s/l9gz2yki0a6? Gallery 214, Visual Arts Building at Northern Illinois University in DeKalb, IL. Show dates October 15-19. Reception October 18th, 6-9pm. Come check out my diorama. Miniature sculptural worlds from 50 Chicago artists for the Octagon Gallery's first Friday event. I was selected to paint a mural in one of Rogers Park's CTA and Metra Station underpasses. Artwork from 27 artists inspired by the life and work of the indomitable Mark Aguhar (1987-2012) is presented alongside pieces by this fearless and beautiful artist/activist/goddess. Uncompromising, incisive, and charismatic in her investigations of gender, queer advocacy, and the politics of marginalized identity, Mark deeply transformed the communities of which she was a part. 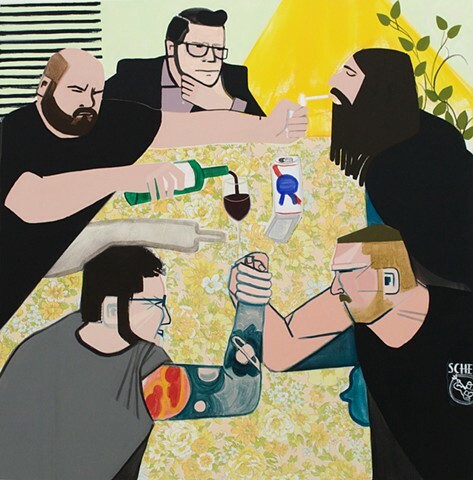 The Dragon is the Frame presents the challenging, compelling artwork she created in dialogue with pieces made by those she was closest to in Chicago. The exhibition format, which intersperses Mark’s works throughout the installation, is an attempt at capturing the way Mark’s communities functioned—individuals in constant communication, always sharing and influencing one another. I will be the new painting and drawing artist in residence at the Lill Street Art Center from August 2012 to August 2013. I get a studio, free classes, and a stipend. Some of my paintings will be at Rainbo Club until the end of July. Go check 'em out if you're in Chicago around Damen and Division. I was awarded a month long residency at the Vermont Studio Center. Come by and have a beer on May 18th, anytime from 8pm-Midnight. Opening party on 5/18 from 8pm-Midnight. Look At Me: 2012 UIC MFA Thesis Exhibition at Gallery400, will be on show from Tuesday March 13th through Saturday March 17th. Reception will be Friday, March 16th from 5 to 8pm. An artist talk will take place Saturday March 17th at 2pm in the Gallery400 Screening room. The UIC MFA Fall 2011 Final Critiques take place from December 5th-9th 2011 and are free and open to the public. All students and faculty will be present to showcase and discuss work from the current semester. Come watch things get REAL! 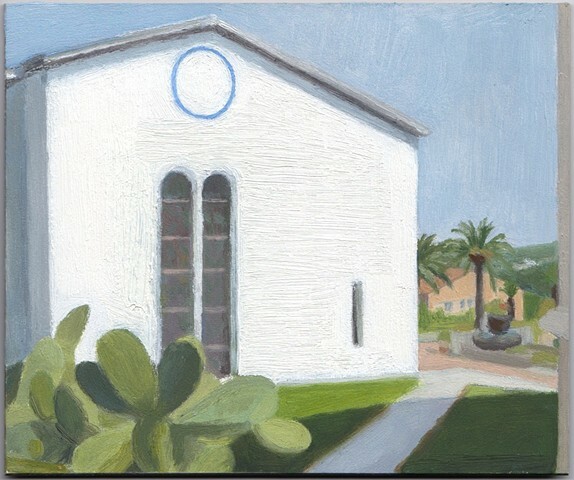 My paintings will be in a two person show at Robert Bills Contemporary on July 8th, 2011 to August 2nd. Some of my paintings will be at the Rainbo Club until the end of May. Go check 'em out if you're in Chicago around Damen and Division. I'm a finalist for the 2011 Union League Civic & Arts Foundation Visual Arts Competition. Boy am I fancy! I was interviewed for Tasty Spoonful! Chicago Artists Month launches this Friday, October 1st, from 6pm to 10pm with an exhibition organized by the Chicago Department of Cultural Affairs, the Chicago Arts District and Gapers Block. The exhibition will also be open from noon to 7pm on Saturday and Sunday. 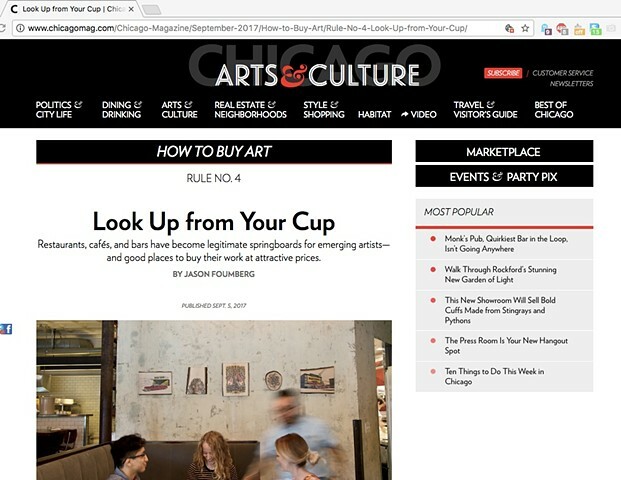 Visit it at the Chicago Arts District space at 2003 S. Halsted Street. Thanks to the ladies of Spoke Gallery, my Hagia Sophia piece got lots of attention. The Hagia Sophia basilica, in Istanbul, Turkey, is famous for its history, beautiful dome, and the mystical quality of light that reflects inside of it. Built in 330AD, it withstood no fewer than 17 sieges between the time it was founded and 1204 when it finally fell to the Christians of the west (the Normans). In its long history, the Hagia Sophia has been home to Pagans, Orthodox Christians, Muslims, and is currently a museum. Saturday, April 17th from 6 to 9pm, Spoke will be home to a miniature version of the Hagia Sophia. Complete with gold dome, marble floors, and 168 windows, this recreation is just big enough to seat one adult inside. Hear about its colorful history, and enjoy the warm golden light of seasonal affective disorder therapeutic lamps housed inside its walls. Hagia Sophia in GLOW November 24th- February 14th, 2010. The Hagia Sophia was just accepted into the GLOW show at the Annmarie Sculpture Garden in Maryland! Yay! Anybody want to help me drive out there and install it? Annmarie Garden is a thirty acre sculpture park and arts center located in scenic Solomons, Maryland. Enjoy an exquisite collection of outdoor sculpture, much of it on loan from the Smithsonian Institution. Location: AMC River East 21, 322 East Illinois Street. The film will go on to screen at the Hot Springs Documentary Film Festival (dates forthcoming). And in January 2010, GOTW will make its broadcast premiere on PBS! Air dates to be announced in December. Roger Ebert gives Heather's film a shout-out in his preview of the festival! rogerebert.suntimes.com/apps/pbcs.dll/a? GIRLS ON THE WALL follows a group of incarcerated teenage girls who get a shot at redemption in a most unlikely form: a musical. As the girls write and stage their play, they're forced to relive their crimes, reclaim their stories, and take a first step toward breaking free of the prison system. I won a CAAP grant! I'm going to use the money to buy super toxic oil paints hand ground by a guy in Brooklyn. Yay! My Hagia Sophia is in the 12th International Art Open at the Women Made Gallery in Chicago, IL from March 6 - April 16, 2009. That Art on Track show I was in and its creator were mentioned in the New York Times! One of my paintings is going to be at the Chicago Art Open at the Merchandise Mart October 3rd-19th. On August 30th, I was in Art On Track, an 8 car CTA train converted into a mobile gallery.